Just installed for XP11. Having some issues with floating objects: any ideas? This is an amazing scenery but KSEA does not do well when using my own Orthophoto scenery. Buildings float and many are missing. Can you provide us with a patch file or you elevation data for use with Ortho4XP so that KSEA has proper elevations. 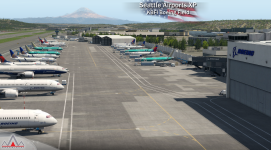 After installing Seattle Airports XP Autogate plugin that is used for other addon airports is broken. Any idea how to fix it? The first floating building is right over the approach end up 16R. It appears to be transparent and the elevation seems sort of off. The floating house is west of runway 34L/16R. There also appear to be some issues with some of the taxi markings appearing blurry. I do have runways follow contours checked on. Same problems as the above. 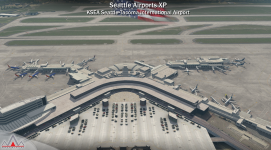 The only way I can get KSEA to display correctly is to put the file ZZZ DD Seattle Airports XP terrain above ortho files and turn on the built in photo scenery. When this is done, the airport displays correctly but ortho outside the scenery is not displayed. The problem with using existing ortho is not limited to a few floating objects . For instance the elevation on short final to 16 is completely off when existing ortho is used regardless of runways follow contour settings. Yes, I too had to remove the included XP terrain file because it was causing my own ortho4xp Seattle scenery to not display. It appears DD Seattle Airports XP/plugins/ includes both the GroundTraffic and AutoGate plugins. Unlike GroundTraffic, AutoGate is a global plugin meant to be installed in X-Plane/Resources/plugins/ -- having a copy in a scenery pack as well can break functionality (e.g. some users have reported on the .org forum that the VGDS systems disappear at SFD LAX after installing DD SEA). First of all..thank tou Mr. Drzewiecki for bringing this great scenery to XP11!!! I had the missing freight buildings issue etc. at KSEA and using a text editor, tried adding the following entry to the apt.dat file for the KSEA entry. Using a text editor and also removed that same entry from KRNT to avoid the sheared off cliff to the West of the airport. Maybe not perfect, but KSEA is better as a result, I'm using the "Forkboy" orthos plus some of my own Ortho4XP tiles to the north of KSEA. This may not be "the" fix, but it seems to help some...XP11 is tricky with the different meshes and setting we can use when making our own Ortho4XP tiles. OrthoXP simply has a different mesh data, so obviously the elevation at which our buildings are placed won't match that data. Hi! First of all thank you for your feedback! Ortho4xp - this program generates mesh and builds phototerrain. If both are active, there are 2 custom meshes - our (from the scenery) and your (generated in ortho4xp). However x-plane can load only one custom scenery. 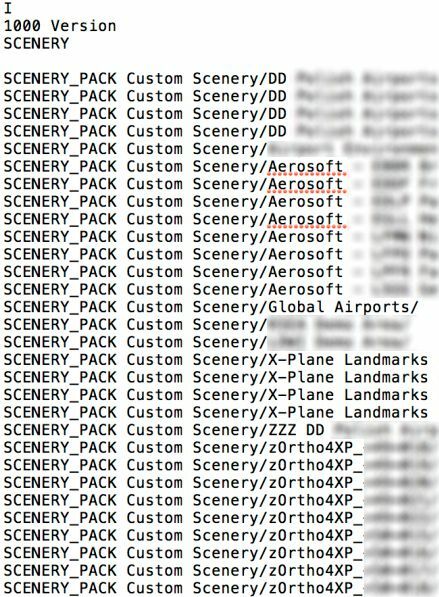 If ortho4xp loads first in x-plane (line with ortho4xp higer in scenery_packs.ini) you have troubles with floating buildings. If our mesh load first all work correct, but your otrho4xp prototerrain is absent. 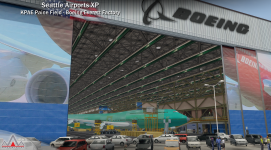 Our mesh works correctly if you use the checkbox in x-plane settings “runways follow terrain”, and your custom meshes (ApolitX HD meshes, or generated Ortho4xp) will not replace our mesh from Seattle Airports XP scenery. You can try to regenerate mesh ortho4xp with custom dem (I do not know whether it will or not be possible, i never use ortho4xp) like this https://youtu.be/sU-PA0BodJU . About blurry signs - you probably have very low texture resolution settings in x-plane. Increase them. I hope we find solution together!